Life in China 2016: A Picture A Day, July 26, 2016 - Today, we took a bus to Guangzhou to pick up our new passports. This is the Canton Tower, a well known landmark along the Pearl River in Downtown Guangzhou, or the historic Canton. The Canton Tower opened in 2010 and at 1954 feet tall, it held the title of the tallest tower in the world for a short time. It is still the tallest In China and third tallest in the world. I haven't been in it yet, but It is used for telecommunications, has restaurants, numerous observation floors, cinemas, a "Sky drop" ride, and at the top of the wide main section is the "Bubble Tram" a spinning cable car ride around the rim! The daytime photo was taken from the US Embassy location and the nighttime photo was taken while we were on an evening river cruise. 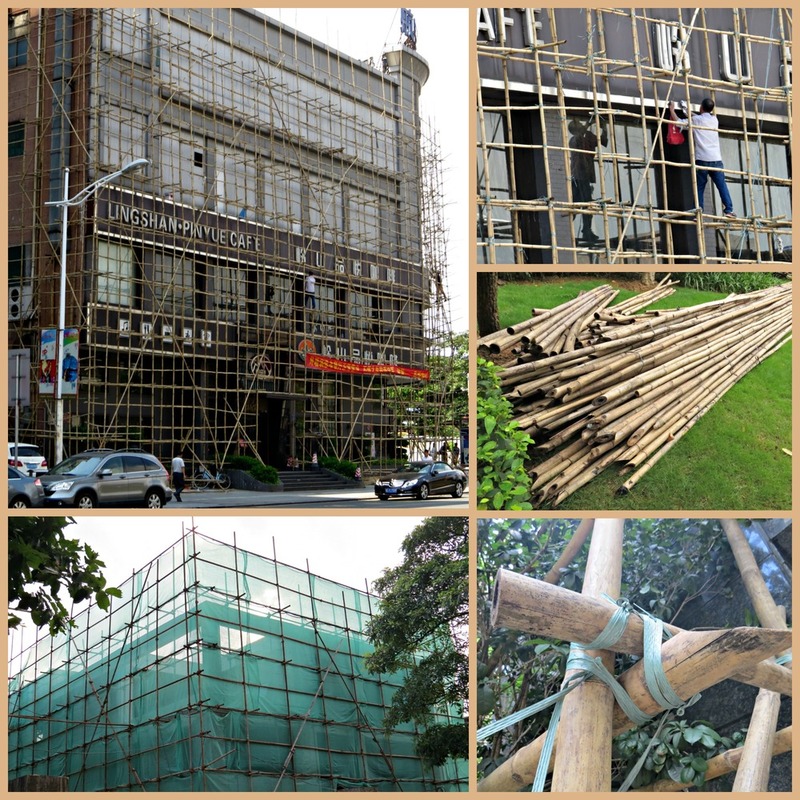 The pictures are, starting with the large one and going clockwise: A building in the next town, Dalingshan, with scaffolding up for maintenance work, a worker who looks like he’s polishing some metal on the same building, a pile of bamboo waiting to be assembled, close-up of how the poles are tied together, and the last one is actually steel scaffolding around one of the villas where we live. Life in China: A Picture a Day 2016, January 3 - This is the gate or archway to Dalingshan Park, in the town next to where we live. Although you just walk right under, it is definitely a separation between the lively, noisy, business area behind where I stood, from the peaceful, quiet, park on the other side.